Toasting brings out the sweet, buttery flavor of the cashews. Spread them on a baking sheet, and cook in a 350-degree oven until golden and fragrant, about ten minutes. Note: Although ingredients vary by brand, hoisin sauce is generally made with soybeans, chiles, and spices. This thick, dark-brown sauce is used both at the table and as a seasoning in cooking. In a medium bowl, toss chicken with cornstarch until chicken is coated; season with 3/4 teaspoon salt and 1/4 teaspoon pepper. In a large nonstick skillet, heat 1 tablespoon oil over medium-high heat. Cook half the chicken, tossing often, until browned, about 3 minutes. Transfer to a plate. Add remaining oil and chicken to skillet along with the garlic and white parts of scallions. Cook, tossing often, until chicken is browned, about 3 minutes. Return first batch of chicken to pan. Add vinegar; cook until evaporated, about 30 seconds. Add hoisin sauce and 1/4 cup water; cook, tossing, until chicken is cooked through, about 1 minute. Remove from heat. Stir in scallion greens and cashews. 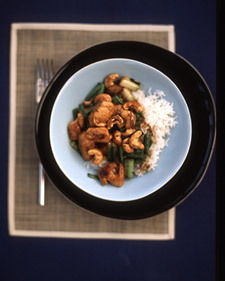 Serve immediately over white rice, if desired.